Please read part 3 of my travelogue if you haven’t already. March 6: I arrived in Tehran and went towards the house of another interesting CS host, Komeil. Komeil was a budding film maker, who was currently going through his mandatory military service. It was already late evening when I met him. I had a great time trying to recharge my phone at a store outside his house because the attendant could not speak any English. In about 5 mins of my being there, there were 4-5 people trying to help me recharge my phone. I don’t think I have seen people who are so helpful anywhere else in the world. When I finally managed to call him, Komeil picked me up from the store. We went to buy some fresh bread later that evening, where we also met Komeil’s roommate, whose name I forget. He worked with a bank. The bread that we bought wasn’t the conventional bread that one would imagine. It was circular, with a radius of nearly 18 inches! On our way home, we munched on the bread. Dinner was bread with cheese, jam, and butter. Tasty and fattening. In 10 days, my stomach had a round shape to it. We spoke about a lot of things, including religion and politics. Komeil was quite a sharp person and asked me many questions. March 7: Komeil had to leave for work, so he gave me a set of keys along with strict instructions about how soft I need to be around the apartment. I had two and a half days in Tehran within which I was to visit Golestan Palace, Sa’adabad Palace, National Museum, Jewel museum, Aazaadi square, main market, and Darband. You will know more about these places when I visit each of them. From Komeil’s house, I took the metro to reach Aazaadi square. It was a great experience travelling in the metro during peak hour. I had to change trains in central Tehran. A gentleman who started talking with me made excellent company during the journey. He was able to guess that I was from India and India commands a warm place in the heart of most Iranians. Aazaadi square (Maidaan e Aazaadi) was quite calm when I reached there. I is because I was there quite early in the morning and no tourists were around yet. The structure, which is like a big gate, was formerly known as Shahyād Āryāmehr, which means in the memory of the light of the Aryans, basically the king. I roamed around the place for an hour, clicking pictures and crossing through the heavily congested streets. I also asked a photographer (one of those who click pictures for tourists) to click my picture with my camera, which he obliged to. I did a 360 degree tour of the structure, which itself is shaped in a large circle around which the traffic flow, and came back to the metro station. Some curious onlookers tried to communicate with me when I was filming the place. I called Farnaz and we decided to meet at the main market of Tehran, Panzdah e Khordad. It is a typically Iranian market with strong similarities to the markets of Old Delhi or Lucknow. Much cleaner of course. I reached early so I was just taking a walk around the place and ended up interacting with some police men. They offered me tea as well. It was sunny and I was loving the vibrant feel of the market. Most of the shops along the sidewalks were dry fruit specific. 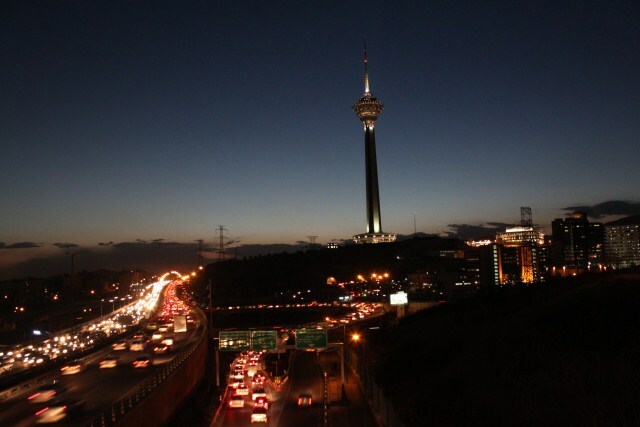 It was quite close to Nowrooz, which is the Iranian new year, and a time when people shop a lot. Due to this, it was very crowded. Farnaz arrived and we went dry fruit shopping. I bought lots of pistas, almonds, and dates. Later we went through the many lanes of the market and also caught up with Farnaz’s younger sister who was with her friend. Then we went to the national museum, which wasn’t too far away. The museum was alright, with some good collection of ancient Iranian and near eastern antiques. 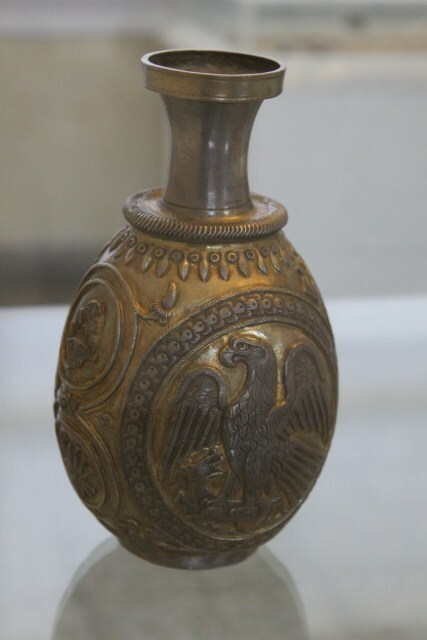 Most interesting stuff was of course from the Achaemenid era. 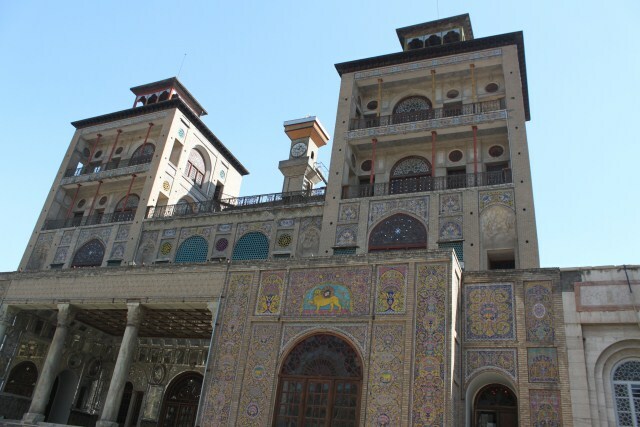 After the museum, we went to the main palace of Tehran and Iran, the Golestan Palace. Originally created by the Safavid kings, the palace and the complex have come a long way during the subsequent reign of the Zands and the Qajars. More recently, the palace hosted the coronation ceremonies of Reza Khan and his son Mohammad Reza Pahalvi. The palace had a number of beautiful buildings, many of which housed specific museums. The most notable of the structures was the Takht e Marmar, Fateh Ali Shah Qajar’s marble throne; Hoze Khaneh, which holds the works of famous European artists; Negar Khaneh, which held the gifts and artifacts received from visiting monarchs; and the famous Shams ol Emareh, which Nasser-ol-Din Shah created to command a panoramic view of the city. Being a world heritage site, the complex is very well maintained. Farnaz had studied quite a bit about the place and was able to provide me as much information as a guide would. We came back to the market and had some excellent kababs and rice at a upmarket restaurant. Then we went to our last destination for the day, the jewels museum. The museum, which is close to Ferdowsi square (named after a great Persian poet), is actually the vault of the Iranian Central Bank. We had to go through extensive security checks before we could enter the museum. It was worth all the trouble. I had never seen a collection so rich, pomp, and grand. It held valuables from nearly 2000 years to 20 years ago. There were quite a few other foreign tourists there as well. Every half an hour, a guide takes visitors through the museum explaining the significant aspects and the history of the artifacts. We spent around an hour and a half there and exited by late afternoon. We had late lunch (pizza!) at a nearby restaurant, and then split towards our respective houses. In the evening, Komeil and I went for a walk and also visited a nearby gym. The owner (Dariush) was a famous Iranian weight lifter, and I had the opportunity to meet him too. He was very cordial and extended an invitation to workout at the gym till the time I was there. At night, we had dinner outside after which Komeil had to leave for a night shift. His friend was not home either but another of his friends, Mahtab did come over. Mahtab was from Esfahan and was a extremely bright girl. She was very fluent and reasonably well-aware of global issues. I had a great conversation with her. I also spoke to another prospective CS host, who was a mountaineer. He was on his way to Mt. Damavand, Iran’s highest mountain. He wanted me to join him, but neither did I have the time nor the equipment. March 8: Today was my last day in Iran. Farnaz and I had plans to visit the Sa’adabad Palace and Darband during the day, after which her family was to host me for dinner. After breakfast, I took the metro to Tajrish, which was the last station on that particular line. Farnaz met me there and we took a taxi to the Sa’adabad Palace. The palace complex was first inhabited by Qajar monarchs and royal family in the 19th century. After an expansion of the compounds, Reza Shah lived there in the 1920s. And his son, Mohammad Reza Pahlavi moved there in the 1970s. 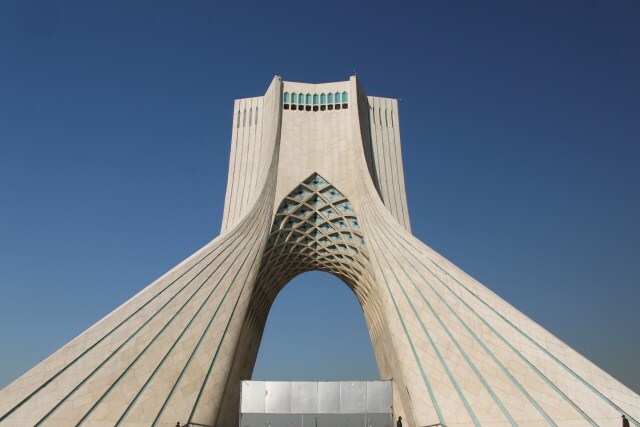 After the Iranian Revolution, the complex became a museum. 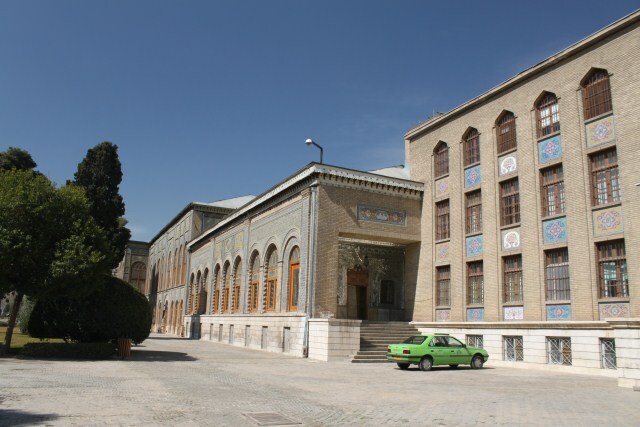 However, the current presidential palace is located adjacent to the Sa’d Abad compound. There are 8 gates to enter the complex. Each major structure inside the complex is called a castle. The best one was the ‘white house castle’, which is the erstwhile residence of Mohammad Reza Pahalvi’s sister. It housed a beautiful museum, full of royal artifacts. The other major palace or castle was the Green castle, where both the Pahalvi father-son duo lived for a few years. Oh, here I got into quite an argument with the authorities, because once again they restricted me from taking pictures with a DSLR camera. Other cameras would do. In one of the other palaces, there was an art gallery showcasing paintings of the famous Iranian artist Mahmoud Faraschian. I bought of couple of paintings as well, which adorn my walls as I write this. The complex was quite huge and extremely well-maintained. We went to numerous other structures and buildings before exiting and taking a taxi to the foothills of Darband. Darband is a popular hiking/weekend trail that takes hikers into the foothills of the Alborz mountain ranges north of Tehran. It was a weekend when we went there and so the place was incredibly crowded. First a lift took us to the start of the trail. The first 500 meters were lined cafes and shops busy soliciting customers. Reminded me of popular trails in India. There was some ice around us, and some freshly molten ice on the trail. After a while, the crowd reduced and the scenery improved. Though I have been on many treks in the past, hiking in Iran was a good feeling! 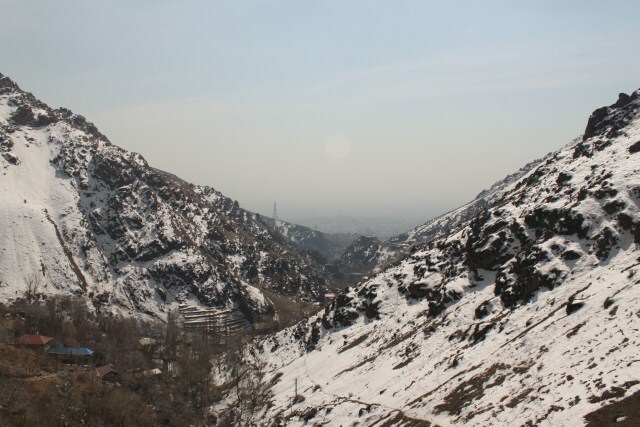 After an hour and half of walking, we reached a great vantage point, from where we could see Tehran city as well as the Tochal Telecabin to the north west. We decided to stop there and took some photos. We even took a quick 15 minute power nap before starting to descent in search of a good restaurant. The weather turned overcast and the mercury dipped rapidly. This range is also very popular with winter hikers and skiing enthusiasts. We finally found a lovely restaurant where we feasted on kababs and rice with curd. The weather was such that I was disinterested leaving the warmth of the restaurant; but we had to. We descended rapidly and split ways. I went home, rested, changed, and got going towards Farnaz’s home for the evening. I took the metro to Shoosh street, where Farnaz’s dad had very kindly come to receive me. Instead of going home, we first went to the airport to receive her dad’s cousin. The gentleman in question was a leading biologist and a very well-known person in Iran. I received him at the airport so that Farnaz’s dad didn’t have to park the car. We went home (to get anywhere in Tehran is a minimum 1 hr drive). During the journey, we spoke about a lot of things. Farnaz’s dad barely spoke English but his cousin did. Upon reaching home, we were greeted by the rest of the family. 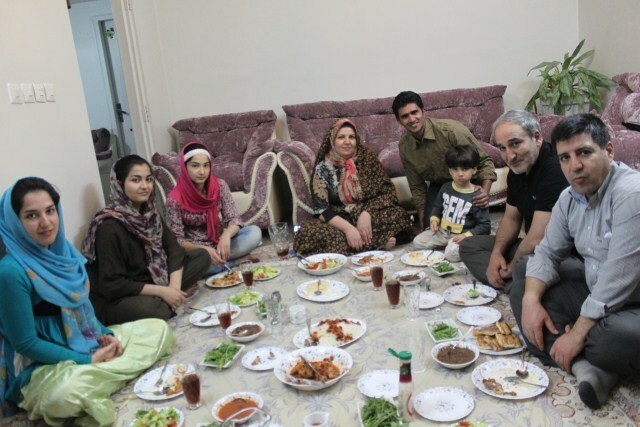 It was my first experience with an Iranian family, and I could already feel the extra ordinary warmth that they are known for. We spoke for a long time where as Farnaz’s mother kept serving us with one delicious thing after other. For dinner, she had prepared a lot of lovely food, consisting of both vegetarian and non-vegetarian dishes. There was also some non-alcoholic wine, from their own vineyards in north of Tehran. After dinner, Farnaz’s dad dropped his cousin and me to our respective residences. I was quite over whelmed with the experience and for hours, kept pondering over it in bed. March 9: All good things end. I had to leave for Bombay this evening. During the day I hanged around with Sepehr and had lunch at his residence. All this friends (Kadereh, Niyusha, and Yas) came home especially to have lunch with me. Farnaz was there too. After this, I called for a taxi and thanked them for all their hospitality. As I write this travelogue, I have an email from Sepehr and Kadereh in my inbox. Farnaz accompanied me in the taxi. We went to a couple of places in the market after which I dropped her near her house. I proceeded to the airport. I was already feeling bad and low. The taxi driver was quite a character and I had a lovely time interacting with him as well. I reached ahead of time and flew to Bombay via Bahrain on schedule. Of all the trips I have done, this trip was special and spectacular, and will always remain to be. I urge my readers to visit the cradle of civilization, Iran, and see for themselves what the country is all about. As visitors, you will be surprises at the beauty of the land and the hospitality of the people. I will be glad to help any one of you plan your trip to Iran and I have made it some sort of a mission to clear popular misconceptions about this great land. Hope you enjoyed reading my travelogue. Please write to me via email if you have any comments or questions.